Just as a new Metro study points to poor service as the key cause of its faltering ridership, an outside analysis paints a profile of the commuters most likely to abandon the system: millennials, the generation said to be killing everything from homeownership to driving to, uh, mayonnaise. Metro’s dramatic ridership declines — from 750,000 average daily trips in 2009 to just 626,000 by May — are most pronounced among the segment of the population ages 18 to 29, the mobile, Uber-savvy generation that makes up the largest share of the workforce (if you expand “millennial” to include those up to age 35). 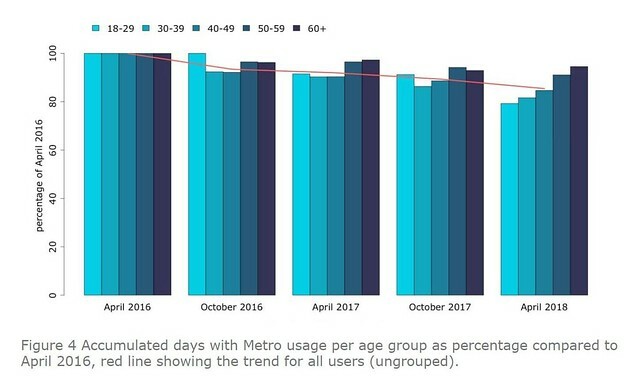 The Teralytics analysis, originally compiled for the advocacy group TransitCenter and expanded for The Washington Post, showed that between April 2016 and April 2018, riders age 29 and under took 21 percent fewer trips on Metro. On weekends, the trend was even worse: Millennials took nearly 40 percent fewer trips when compared with the same month the two years before. As the data shows, that’s a real problem for Metro because millennials, many of whom have shunned car ownership, make up around one-fifth of transit users and the largest share in the study, according to the authors. (The authors noted the millennial age range was slightly wider than the other categories; And yes, they say, their study adjusts for factors such as the increased likelihood that millennials are carrying a cellphone or commuting to 9-to-5 jobs). …the Teralytics data illustrates how dramatic the declines became for a critical segment of the riding population. In April 2018, according to the company’s analysis, millennials were taking more than 30 percent fewer trips than two years before. By contrast, ridership among those 50 to 59 years old was down, but by a figure closer to about 10 percent. But Metro’s losses were more extreme than those of its peer systems amid a period of chronic service and reliability problems that plunged ridership to early 2000s levels. Connolly said Metro simply needs to step up and provide a consistent, reliable ride. “If we’re going to reverse the loss of ridership, that [Metro] study tells you point blank what the real problem is,” he said. Weekends are another key problem for the agency. Metro says two-thirds of its ridership losses over the past two years have come during off-peak and weekend periods, when the agency typically launches its most disruptive rebuilding and maintenance work, and the system becomes harder to access. For some age ranges, such as the 50-59 and 60-plus groups, weekend ridership actually increased compared with the same period in April 2016. Millennials were a different story. Those 18 to 29 were taking just 60.5 percent the amount of weekend trips they had taken in April 2016, before SafeTrack, according to the data. The declines illustrated a dramatic trend: While ridership among some age ranges has fluctuated over time, the percentage of millennials riding has consistently decreased. The other thing to note is that walking, biking, and scootering are easier when you’re younger–this also factors into the age pattern. Like it or not, D.C.’s failures of governance, including Metro, affect everyone. D.C. is full of people who are interested in government, regardless of which side of the aisle they’re on. These are typically younger people, for many of whom D.C. is the first time living in a city and dealing with local government as adults. Every time there is a failure of governance, a new cohort is taught that government is a failure and that urban living is screwed up. Neither of these lessons is helpful. I realize there’s a lot of maintenance to be done, but Metro–and as importantly, the D.C. area leadership–need to emphasize service and reliability. Too often, it seems that fears over safety (even though the system is far safer than driving a car) are used as excuses to provide bad service. Finally, one thing that would be worth knowing is if within-D.C. trips have declined more rapidly than trips that start or end (or both) in Virginia or Maryland. I’m guessing, based solely on my (probably skewed) experience that most of the decline, especially on the weekends, are D.C. residents who simply aren’t using the system on the weekends to get around. If that’s the case (and I’m going to try to dig up data to examine that), then that is something the D.C. Council needs to focus on–even though much of the Council and the city government is trapped in a time warp.